TV was in the US, where he created Fox Broadcasting Company in 1986.
business newspaper, The Wall Street Journal. career, Ganesha tries to read his stars and foretell his future! financially and has had a highly successful career so far. has Saturn-Moon conjunction in the Ascendant that creates Vish Yoga! Bhagya Bhuvan, Sun aspects it's own sign Leo, the Bhagya Bhuvan. was a brief conclusion drawn on the Natal promise of Murdoch's chart. 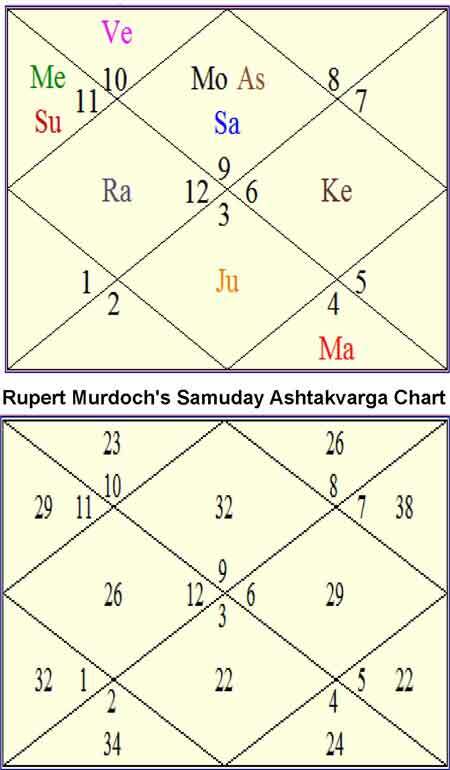 June 2014, after which Saturn Mahadasha begins. house of legal battles or 'opposition'. years. He may have to pay a hefty sum as fine. house from the Ascendant and the Moon. he doesn't give strong fight and take necessary steps in time. hacking issue but he may have to pay a hefty penalty to resolve it. logjam, but his image would take a major dent. adversities till mid of 2014 and take very good care of his health. Lord Ganesha bless Rupert Murdoch with happy times ahead.